You Think $4 Gas is Tough! This was spotted by your humble blogger at the corner of Thurbers Avenue and Eddy Street in Providence, RI today. New Orleans keyboard cat Henry Butler (above at the Narrows piano) brought Crescent City warmth with his sometimes rollicking, sometimes progressive jazz-like, sometimes this-side-of-Mozart performance to the Narrows Friday night. From the start he showed that, in addition to his boogie-woogie capabilities, he could bring classical and "prog" stylings to tunes like the Beatles "Eleanor Rigby." At the same time, he praised New Orleans songwriters for their poetic lyrics like "I'm waitin' for my ya ya" that he suggested, tongue-in-cheek, ranked up there with Yeats. My guess is more people understand (and appreciate) "waitin' for my ya ya." Below: some of the crew at the Narrows that truly adores Henry and wanted a personal keepsake of his performance. Here's to you guys! Suitable for framing! He's coming in August. Tickets soon to be available at www.ncfta.org. Need we say more? Other than he pretty much founded country rock. 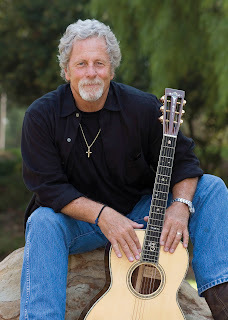 Chris was an associate of Narrows' patron saint Gram Parsons and WAS THERE when country western & rock 'n' roll realized there was common ground on which to build. Corny country and the Rolling Stones weren't that far apart. U.K. balladeer, singer and guitarist Steve Tilston charmed the Narrows Friday night. It was his first visit to the venue, though he was familiar to some from his playing New Bedford's Summerfest. Came across a nice review of the latest CD from Narrows alum Sonny Landreth. Check out the write up right here. Lil' Ed was on his toes playing the blues with his band the Blues Imperials Thursday night at the Narrows. It was an electric, slide guitar blues night, starting off with "Dust My Broom." Not yet posted on the Narrows official schedule yet, but it will soon be. Visit www.ncfta.org. Two of the strongest singer/songwriters in the genre today. Slaid Cleaves has graced the Narrows stage many times, traveling to our shores from Texas, although he's originally from Maine. Mary Gauthier--who once lived in the Boston area but now lives down south--has played the Narrows before, but not nearly enough. She won huge acclaim for her "Mercy Now" CD a couple years back; even Bob Dylan played a song from it on his radio show! If you like tunes that are about something, this show is for you. The fab Wood Brothers--guitarist Oliver and stand-up bassist Chris--brought their version of folk-rock-whatever to the Narrows Thursday night. With Chris' jam band credentials (Medeski, Martin and Wood) and his laying down much more than a boom-chick foundation, the guitar may sound folk but the bass line is Mingus. Opening for the gentlemen was songstress Pieta Brown, who also sang on the Wood Brothers' new CD. Her dad, Greg, plays the Narrows soon. Though we still have a spring and summer full of great shows, we are very pleased to announce that Grammy Award-winning roots pioneer Taj Mahal, will play the Narrows' 7th anniversary show on Saturday, November 8th. Tickets available right now at www.ncfta.org. Have we worked together before? asked Big Brother guitarist (and one of the group's founders) Sam Andrew (below right) just before being introduced on-stage at the Narrows by your humble Backstage Blogger. You look like somebody, he said. and friendly. That's important to the crew at the Narrows. And for the audience, too. After the show the band spent quality time with them, always a wonderful gesture, since band members are sometimes exhausted after a performance. Two other original members--David Getz and Peter Albin--joined Sam along with fab singer Lynn Asher (filling in for Janis) and a young guitarist (filling in for guitarist James Gurley, who apparently no longer works with the band) who looked like he was being mentored by Sam, although he had terrific chops. That's Lynn and Peter in the photo above. Yes, they did the hits, including Summertime, as well some new songs, too. Opening the night was Louie Leeman and Cheap Sneakers, who got the ball rolling with their stellar musicianship, impeccable musical taste, and gentle humor. Narrows alum Fred Eaglesmith's latest CD is reviewed here. 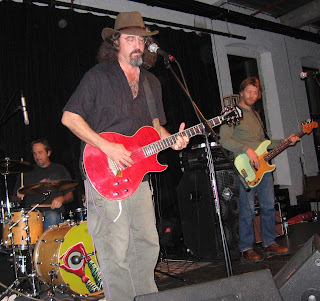 Narrows alum James McMurtry (photo of him above taken at the Narrows in 2007) has a new CD and it's a MONSTER, baby. Called Just Us Kids, it's near the top of the "Heatseekers," "Tastemaker," "Indie Label," and "Top 200 album sales" charts at Billboard Magazine. And it's numero uno on the americanaradio.org chart as well. Narrows alum Crooked Still, whose debut album is considered by your humble Backstage Blogger as a roots classic, is releasing CD number 2 on June 24th. It's called "Still Crooked," and, according to the latest missive from the group, features songs by Mississippi John Hurt and others, including a couple originals. The group has changed its lineup a bit; hence, we would surmise, the CD's title. The group's Aoife O'Donovan, touring with side project Sometymes Why, just played the Narrows. You've heard of Glam Rock--is it time for "Glam Roots?" Three lovely young talents playing hooky from their usual groups--Crooked Still, Uncle Earl, and The Mammals--glammed up the Narrows' stage Saturday night. Aiofe O'Donovan (Crooked Still), Kristen Andreassen (Uncle Earl) and Ruth Unger Merenda (The Mammals)--calling themselves "Sometymes Why"--mixed minimalist instrumentation with lush vocalizing, charming the audience and trying to avoid waking Ruth's 3 month old baby boy back in the "green room."